PADI’s online scuba programs allows you can get started today with the knowledge development portion of the course and work at your own pace using the PADI eLearning® system. This convenient, interactive study option allows you to learn anytime and anywhere you have an internet connection. 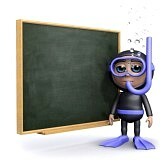 Contact us at Mountain Bay Scuba anytime you have a question about what you’re learning. Hands-on classroom learning in a fun atmosphere with PADI-certified Instructors and Dive Masters. Get all of your questions answered and interact with fellow scuba students. Learning to scuba dive requires both knowledge development – including facts, principles and concepts – and dive skills including techniques and methods. Our Live Classroom Experience uses videos, audio, graphics and reading to help you learn, plus short quizzes that let you gauge your progress, and then offers a review of anything you happen to miss. You can start developing dive skills immediately during your interactive classroom with our experienced and knowledgeable instructors. See our SCHEDULE for dates. I go out of my way, living in Howard, to visit Mountain Bay Scuba. There are two other shops in Green Bay (which shall remain nameless), but the service, expertise, and friendliness of the Mountain Bay shop makes all the difference! I have taken Discover Scuba & recently became Open Water certified through them...and will continue my classes through them as well. I believe in giving credit, where credit is due...so, I cannot recommend Mountain Bay highly enough. Join our mailing list today! Emails will never be sold, rented or abused!